Berwick's Payden Montana left some big shoes to fill for the top throwers in Pennsylvania this season. Now at Penn State, Montana had a dream senior season in the shot put, winning a state title and approaching the 50-foot mark during the indoor season. Outdoors, she threw 51 feet and won a national title. Who's next in line in PA? Keeley Suzenski will look to convert what was a breakthrough junior season into an even bigger senior campaign. Suzenski, who competes for Reading during the indoor season and Berks Catholic outdoors, took second to Montana at indoor states, throwing the top returning put of 42-4.5 In the spring, she improved even more and placed second to Montana again in AAA at states, eventually throwing a best of 46-1.25 at nationals. A pair of returning indoor medalists will be looking to take the top spot as well. Mallory Kauffman of Greenwood, a Penn State recruit, was fourth at indoor states last season. 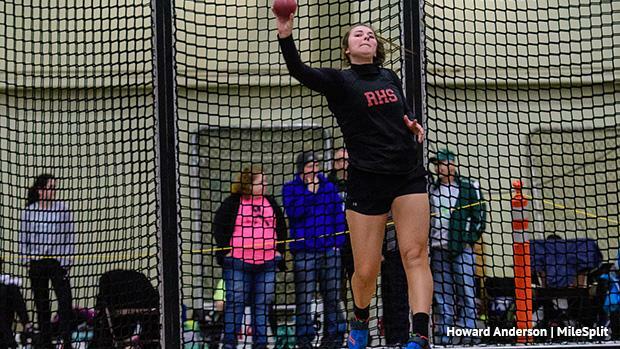 She threw over 40 twice (and then over 44 feet outdoors) and will be one to watch for. Lillia Allen of Penn Hills, another senior, should be strong as well. She threw an indoor best of 41-6 at a TSTCA meet and took fifth at indoor states, just behind Kauffman. The other state qualifiers from a year ago that are back this season are South Park's Maura Huwalt, Hempfield Area's Mackenna Orie, and Germantown Academy's Meaghan Toscano. Huwalt is a veratile thrower, who medaled in all three throwing events at outdoor states last spring. She was 10th at indoor states. Orie was 12th at indoor states and sixth at outdoor states in AAA. She'll aim to move onto the indoor state podium this time around. The lone returning non-senior to have thrown over 40 feet last winter is Toscano. 13th at indoor states, she rolled to Inter-Ac and PAISAA crowns outdoors. The junior will be a contender again this indoor season. Souderton's Maria Deaviz, Strath Haven's Jordan Brown, and Peters Township's Caroline Fyock are among the other girls coming off solid outdoor seasons that will be worth keeping an eye on this season.